It all started when I was travelling in the province of Foggia in northern Apulia in southern Italy. Having recently become confirmed into the Catholic faith, I was interested in finding out more about my nominated saint – St. Pio. So I decided to visit the Padre Pio Shrine in San Giovanni Rotondo. And what a beautiful place it was! I will never forget the aroma of Lavender that hit me as I walked towards the crypt and the large crowds of queuing Italians (yes, really queuing) to see and touch St. Pio’s tomb. All this against a backdrop of the hospital that St. Pio founded in this small town. Later, I visited Monte Sant’Angelo, just up the mountain, where Saint Michael the Archangel appeared in 490, 492 and 493AD. Here, I found a church situated within a cave. It was truly atmospheric, although quite hard on the knees when it came to kneeling for Mass! On my way out of the cave, I was greeted by a small group of Franciscan nuns who were eager to talk. They were extremely inspiring, and they revealed that they have no income and rely solely on charity. Judging by their healthy appearance, they were doing very well on it! I was particularly touched when they told me that I was blessed and had been chosen to enter the Catholic faith. followed by Medjugorje in Bosnia. Both of which inspired me to go on this incredible Camino de Santiago to walk and meet people from all walks of life with one question in common – What’s it all about? So what is the Camino de Santiago? It is the way of Saint James, and all Camino routes lead to Santiago de Compostela where the remains of the saint are buried and were discovered in the ninth century. The remains of St James the Great, one of Christ’s apostles were brought to Santiago all the way from Jerusalem by boat in the ninth century. I must admit, I felt like a bit of a fraud after arriving in Santiago and dropping off our cases at a rather nice hotel before being driven to our starting point. It didn’t seem right that I had already caught a glimpse of the cathedral before starting our journey. Anyway it gave us a chance to catch up on some sleep in the back of the taxi. We were all looking forward to an early night. The next morning I was feeling very apprehensive as I had already picked up a few injuries in training. This coupled with the fact I had left my makeup in Santiago and was for the first time going bare-faced. Anyway, I began our journey in good spirits and relative ignorance. Thank goodness I had no idea just how long I would be walking! And so with our best feet forward (and our best socks), we begin our journey from Ponferrada to Villafranca del Bierzo. Each of us with a scallop shell, an ancient Christian symbol, dangling from our rucksacks – a symbol of pilgrimage to symbolise our journey towards Heaven. We all have one thing in common – we are going to finish this journey even if it kills us – little did we know! Each of us have a Pilgrim’s passport which has to be stamped in every town we pass through as proof of our journey. 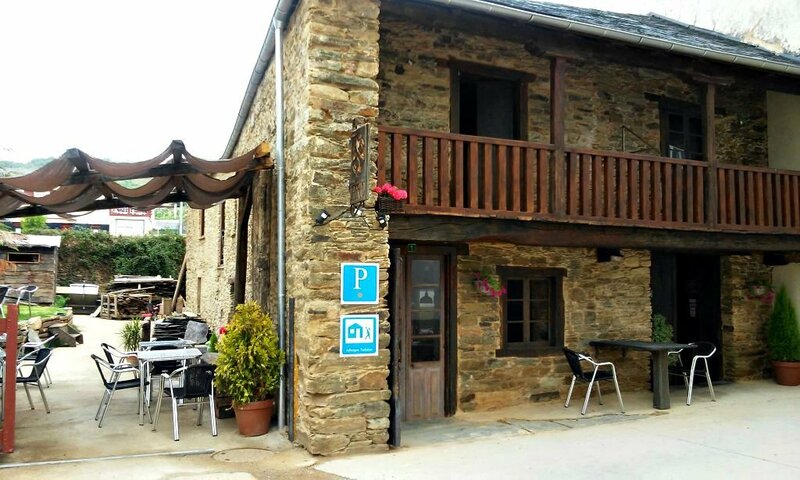 This is an excellent idea for both pilgrim and café owner, as it encourages you to stop and experience some of the culture and the sincere friendliness of the locals. Pilgrims are treated with respect and we are soon introduced to the age-old phrase “buen camino!” which amazingly, the locals never tire of repeating to every pilgrim they pass. The small chapels we pass along the way are also offering passport stamps and each one is lovingly cared for and open for prayer. This one in particular proved to be a beautiful place of refuge and meditation. Roof Fresco of Last Supper -Diocesis De Astorga, Fuentesnuevas. Notice the disciple in the bottom left corner wearing glasses! He has been up-dated to resemble the current Priest. Walking almost non-stop is becoming more and more arduous and this is only the first day! And as the sun grows stronger and stronger, I am beginning to wonder when on earth we will reach our albergue to rest for the night. The Hills are Alive with ……. After 30km and a rather long detour around the outskirts of the town, I begin to get decidedly ratty. “I am not going another step further until I know we are going in the right direction!” I say as I still continue to put one foot in front of the other, unable to stop the momentum of my poor aching legs. Knowing how difficult it is for most men to ask for directions and insisting on following a map in a questionable guide book, I decide to take the matter into my own hands (the only appendages that don’t ache) and ask a group of men who look like locals. “Do you know where auberge Venecia is?” I say in my best Italian, (I don’t know any Spanish) One of them detects my sheer desperation and after a short period of mental translation kindly sends us in the opposite direction! At which point I am ready to break down and weep, but he suddenly changes his mind and directs us to a place which is just up the road and around the corner. Oh, this is music to my ears. 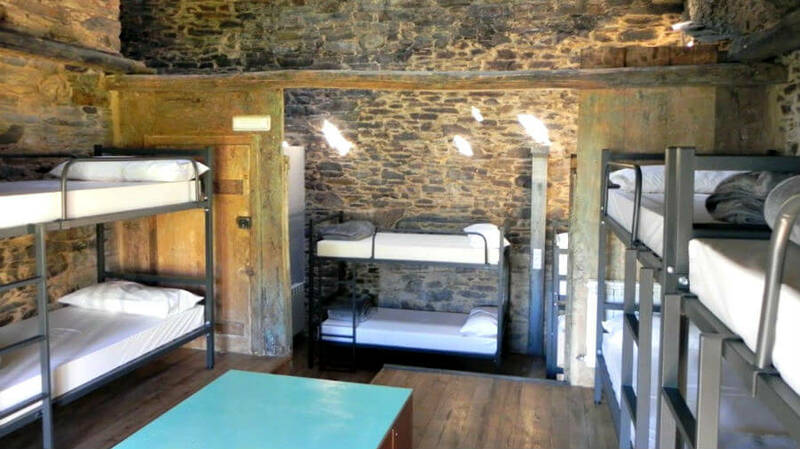 The albergue could have been a hay barn for all I cared, just as long as I could rest. I think I know now how Mary and Joseph felt when a barn was all they were offered and they jumped at the chance! Well this place doesn’t exactly have ‘curb appeal’ either. We ring on the bell and are greeted by a short, stout Spanish lady who half-smiles at us. She’d probably been wondering where we’d got to and if we were ever going to turn up. Thankfully, she is extremely hostel-proud and the place looks like it’s been scrubbed from top to bottom with a small tooth brush. Now this really is my kind of Heaven (given the circumstances). The last thing I need is a lesson on how the coffee machine works, which our landlady insists upon before retiring to her own home. So I leave that to Caroline while I throw myself onto the bed like a Lemming jumping off the edge of a cliff. I immediately wish I hadn’t. It was like I had landed at the bottom of the cliff, but had actually survived the fall. It was soooo hard! At this point I feel like a disappointed Goldilocks who has no other beds to try. This is it, so put up or shut up! But where is the pillow? I ask myself. Oh dear, there is no ‘pillow’. It is simply a long, firm padded sausage that runs from one side of the bed to the other. Also devoid of any comfort. Completely exhausted, I lie down and immediately drop off to sleep. “Come on, Liz!” Robin shouts, to raise me from my comatose slumber. “We are walking into town to find somewhere to eat.” Oh no, I think, I can’t possibly walk anywhere now. I then notice a lack of feeling at the side of my head where my ear normally is. It’s been paralysed by the sausage! We walk into town and find a restaurant where the locals go. But then there aren’t any tourists round here anyway! It is a typical Spanish menu – Squid, Octopus, burgers and no veg! We feel a lot better and walk back to the albergue. Now it’s time to assess the damage I have inflicted on myself. Ouch! Now I know why I was hobbling. My blister I had gained in a training walk to Rye has grown, but worse than that, I have a red rash around my calves and ankles. My spirit plummets, as this is something I was dreading. It has happened a few times before after a hard day’s walking in the heat, but it always went away in time. But now it could only get worse with another ten days of walking ahead. I spend the night unable to sleep on the hard as iron mattress and ear paralysing sausage, wondering what this condition is and how I can help my predicament. So when dawn arrives, I know exactly what I will do. With scissors in hand, I cut off the bottoms of my brand new hiking trousers and then cut off the tops of a new pair of Merino wool socks. “There, that should do the trick” I tell Robin as he raises his eyes to the ceiling. And as if it was meant to be, Robin suggests that the tops of the socks could serve as a pair of gloves for Caroline, who hasn’t brought any. That morning, we set off early after a pre-packed croissant, a piece of toast, and a coffee made from a capsule. The weather has changed dramatically. It is very cold, being 527m high and there is an icy wind. I look like a wooden puppet with its trousers shorn off and bare ankles while Caroline is happy with her new gloves. We were both happy, and that’s all that mattered. Walking alongside a major road is not what I’d envisaged, but we plough on, laughing and joking with other pilgrims as we go, all with the same aim, but each of us on our own journeys. Thousands and thousands of pilgrims have trodden this same path before me. If they can do it, so can we! So we are on the road again, heading for Lugar, Herrerias and after a couple of hours walking in the cold, we decide to take a break. We open the door to a cafe, and it is like we have stumbled across a completely different place in time. It reminds me of one of those Western films when the cowboys enter a tavern to escape the icy cold wind. The door slams behind them and they are in a warm bar. They bang their sore feet up on a table and order a whisky. Mine’s a double shot of rye!!! Well this wasn’t that much different, as we all immediately disrobe and take off our shoes and socks. We don’t put our feet on the table, of course, but I don’t think anyone would bat an eye if we did as it’s the usual practice around here to nurse a blister in public. No-one stands on ceremony. Instead of a whisky, I order a hot chocolate. Absolute Heaven! Although I would point out, there is a bit of a pong pervading the café. I try not to think about it as I gulp down my warm milky drink, although I am already mentally blaming the woman sitting in the corner writing on her iPad for making such an awful smell in the Ladies. It is now beginning to permeate my clothes. This is something I will have to get used to on this trip. Using public toilets and ignoring the odour. It goes with the territory when you are travelling with so many other pilgrims who probably aren’t fortunate enough to have their own bathroom facilities at their hostel. So I mentally give myself a telling off as Caroline helps me change a blister plaster and we are on the road again. What a Princess I am, I think to myself. This has got to change! There’s a complete shift in the weather and the sun is shining. We approach a chemist and I decide to ask the pharmacist if she has anything for my rash which is getting worse again. As I gingerly raise my shorn off trousers, she takes a brief look and gives me a knowing nod. She tells me she had the same thing happen to her when she did the Camino, sells me some cooling gel which literally costs an arm AND a leg and tells me to cover up my ankles to protect them from the Sun. I take her advice then and there, apply the cream and put on some long supportive socks. A bit hot, I think, but they are all I have. I heave my back pack on again, tighten the strap to the nth degree and soldier on. Up and up we go taking in the glorious views, and then it strikes me. “Oh no! I’ve left the cooling gel back at the chemist!” I shout to Robin. A pained expression comes over his face, but then without hesitation, he is bounding down the hill still carrying his rucksack! After about 20 minutes, he returns jubilantly with cream in hand. Oh how lucky am I, I think. My Prince Charming! I’ve been truly blessed. But I really will have to stop behaving like the Princess! Herrerias is truly a place of beauty and serenity and when we arrive at our hotel, find there is a fantastic view overlooking the countryside. We unwind in the warmth of the sun enjoying rather large gins and some tonic. They don’t seem to bother with measures out here. They simply bring the gin bottle to your table and pour in half a tumbler full! Fonfria is our next destination and we set off wishing we could stay a little longer in Herrerias. The sun is just beginning to shine again but the morning is still fresh and crisp. There are lots of hand-made works of art dotted along our path that we stop and photograph. We can’t resist trying to capture the moment. Such rural beauty with the cows and their bells clinking as they feed on the grass in the early morning sun. It’s a perfect time for reflection and thank God for all my blessings. There is such a feeling of love all around me and it makes me feel truly grateful to be alive and able to make this journey. Now the big climb begins from Herrerias at 600m to O Cebreiro at 1300m and then a slight descent to Fonfria at 1283m. The camaraderie amongst pilgrims is tremendous as we climb higher and higher and the heat of the sun becomes more intense. But no-one’s complaining. Even a cyclist who is straining to ride his bike up the hills and divots, manages to multi-task and take a photo on his mobile of the incredible panorama. As the day gets hotter and the walking continues, my rash on my legs feels itchy. I hate it. This is my cross to bear, I decide, since I have always been troubled by circulatory problems. Oh, how I wish the Sun would disappear, I think, as we reach another main road to cross to see a large, imposing statue of a pilgrim. OK, yeh, right, really nice…. We eventually reach our next albergue. In fact, as we stumble towards the entrance, we get a round of applause from the other pilgrims who probably arrived a few hours before us! This is the place we have been looking forward to. There will be a proper pilgrims’ meal where we can eat and share our stories at the table and generally relax in good company without a care in the world. And it certainly doesn’t fail to deliver! We have the best Galician soup ever and as much food and wine as we want. We laugh and chat to our dinner guests, who just happen to be French and Chinese, topped off with an ‘Eau de Vie’. A clear colourless fruit brandy. Life can’t get much better than this I think, as we all hobble off to bed. Up at the crack of dawn and that familiar smell from the dormitories and the loos is pretty pungent. Nevertheless, we have breakfast and are back on the road heading for Triacastela. “Only thirteen kilometres away!” Nick had promised. This is our so called ‘rest day’, as it is Caroline’s birthday. We enter Triacastela, a pretty one-street town with a beautiful church and countryside. When we arrive at our albergue it’s early and there is a sturdy-looking American guy sitting outside. “It’s not open until midday,” he tells us in his Wisconsin drawl. We sit down and join him in the wait, quite happy to sit and rest here for as long as it takes. This guy is really suffering with his feet. He began the Camino from the very start and has been walking for weeks. In fact, he had blagged a taxi ride from Fonfria to this place to save his feet. Taxis operate between destinations to transfer ‘pilgrims’ rucksacks. This is definitely a cop out in my opinion. Where’s the struggle if you haven’t got your worldly goods firmly strapped to your back? This guy is not one of those. In fact, he tells us that his excuse for doing this camino was to begin in Poland helping to build social housing with a charity called Habitat for Humanity (Habitat.org). Being a retired builder, that was his way of giving something back. We chat about our own trials of building a house back in England and give him our best advice on blisters before Caroline and Nick arrive. They’d enjoyed a bit of a lie in this morning! The owner opens up and we are shown to our rooms. Wow, this is a beautiful old stone building that he has clearly renovated with attention to detail. 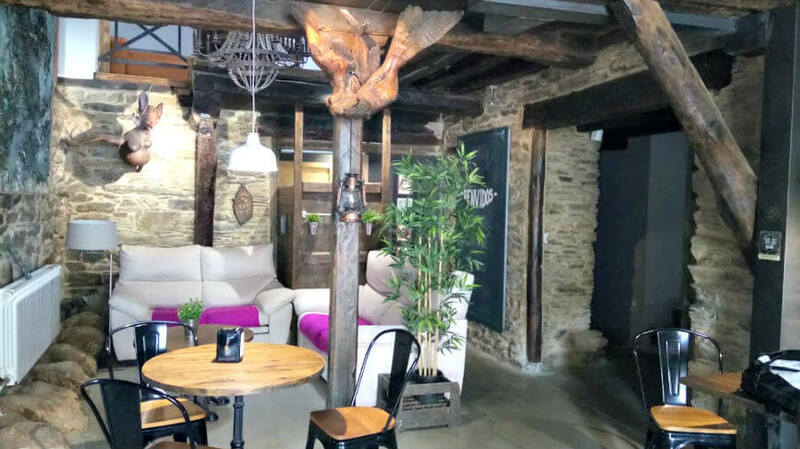 The décor is a mix of old stone with wood and has modern furniture. The straight cut white blinds at the windows set off the stone beautifully. There are small dorms here too that look inviting enough, even for a princess. Our room is on the first floor, overlooking the street, a beautiful combination of old and new with lots of glass and oak beams. However, the designer clearly was not concerned about privacy as you can hear everyone’s conversation and as you step out of the shower you can be seen by everyone in the reception area – best have an early shower!! Outside just below our window, an older, probably homeless man is shouting about something. His speech is slurred but aggressive, clearly drunk and trying to beg for money. A young pilgrim approaches him and tries to calm him down. “I am only a student, I haven’t got any spare money, but I’ve got a small amount of food that I am happy to share with you” he tells the man. He offers the man some bread and a carrot which the man accepts. He eats the bread but after one bite of the carrot, tosses it into the air. Oh dear, what is it about Galicians and vegetables? Mind you, I do feel very proud of the young pilgrim’s actions. A lesson to us all methinks. We decide to go in search of a supermarket, recommended by the American guy, that stocks everything and on the way we come across another chemist. The others persuade me to go in to show off my very swollen, but well-turned ankles to get a second opinion on the ever-increasing rash. The usual remedy of cooling gel is advised, but after telling her I’d already got some, she advises me to rest, or at least reduce the weight in my ruck sack. It is the extra stress on my vascular system that’s causing the problem. Not music to my ears as once again I am forced to be reconciled with this circulatory condition which has blighted my life. I come away with some Venaforce tablets that are supposed to be miracle workers. We find the supermarket, and then in hope of finding a menu that includes vegetables, find a nice restaurant for lunch to celebrate Caroline’s birthday. A very nice Paella it is too. We could have had a mixed salad as a starter, but that isn’t our idea of vegetables. It seems like Galician soup with cabbage, broad beans and pork as its main ingredients is the closest we’ll ever get to our 5 a day. We go in search of a famous mosaic in the town that our guide book mentions. I follow on blindly with very little hope of finding it, given this guide book’s reputation thus far. We do however see several signs pointing to its location. Heads bowed and about to give up, we suddenly realise that we are standing on it! Hmm.. time for some rest. We agree to meet up for the 6pm Mass. It is once again a beautiful church. It has an above-ground tomb-like graveyard which is a resting place for the whole family. This is a comforting sight and I begin to think how nice it would be if I could have a similar plot with my own family. The Spanish Priest is softly spoken and although I can’t understand very much, he is obviously speaking from the heart, especially when he refers to the pilgrims who account for most of the congregation. We pray and leave feeling blessed. Our next stop is Sarria and the forecast for the following day is pretty dire – wet and windy. “That’s a shame,” I say, secretly loving the idea of setting off in the cool rain, and feeling it splash around my ankles. And the forecast is true to its word. As promised, we wake up to the sound of a wild storm blowing outside our albergue! Everyone meets up downstairs and starts kitting up. At last it’s an excuse to wear our ponchos! I would hate to think we had carried that extra weight unnecessarily. Robin has also offered to carry my spare pair of trainers and all the medication to reduce the weight in my rucksack. The struggling Princess feebly tells him not to, but he takes them anyway, and I don’t complain. I feel a pang of guilt and begin to think that perhaps those joy-rider pilgrims who use the taxi service may have a point! It’s like a scene from a Tolkien novel! With ponchos on covering our rucksacks we look like a group of hunchbacked trolls. Walking in the pitch-black dark in the rain is an unusually pleasant experience and as we have set off without breakfast, we are on a quest to find some. Looking for our friend Quasimodo? We know from our really reliable guidebook that there aren’t any cafés for around 5km, so when we come across a ‘Donativo’ it’s a welcome sight! A Donativo, we learned, is a shelter providing free rest, food and drink to pilgrims. There is no obligation to pay, only whatever you can afford. This is our first and it is excellent. A small commune of creatives who are extremely welcoming – hot coffee, home-made cake and fruit, as well as fun and interesting conversations with other pilgrims and musical instruments. We listen to a violinist play a Ukulele like a guitar while sipping hot, fresh coffee from a jam jar and munching on a banana. Caroline talks about her trials of learning to play the fiddle and I make a concerted effort to brave the compost loo, which isn’t too bad actually, while Nick picks up a guitar and knocks out a tune. There are all sorts of different kinds of people here, including the obligatory skinny hippie types with their sunken stomachs beneath cable-knit pull-overs and over-grown bearded smiles. They remind me of Robin when I first met him. Skinny with shoulder-length blonde hair and a pair of John Lennon glasses. I look at him and notice how he has matured since those days both physically and mentally. He is still that hippie deep down inside but has had to grow a hard shell to protect himself from ‘the elements’. I wonder how these hippies will evolve in the outside world away from this nucleus of like-minded, peace-loving people. In fact, I wonder if I will be able to take some of this away with me and keep it in my heart for when I’m back home. Caroline and I wash up our jam jars at the outside kitchen area and then load up with our rucksacks. Once again into the breach with walking poles deftly poised we resume our journey with high spirits. I am struck with the thought that this journey is a bit like giving birth. The agony of childbirth is soon forgotten after the birth of your new-born child… but it’s worth it! Along the way, we are all fooling around again, and Robin decides to attempt a long jump across the stream. He slips and carries on, although we later find out he has injured his ankle. We eventually arrive in Sarria, although the really useless guidebook has done its best to mislead us again. We end up walking around the town to reach the other side of town to find our next albergue. It happens to be a renovated bus station and our rooms are clad with dark, wooden panels. We freshen up and go out again to find ‘linner’ (lunch and dinner). The restaurant is a good one and we relax and unwind while enjoying a protein rich dinner – no veg. of course. We arrive back and it is very clear that Robin has been in an awful lot of pain with his ankle. He falls asleep on the bed and I am left thinking what we should do. Do we carry on regardless, or do the sensible thing and go back home? I am certainly not going to carry on without him, although if I tell him that, I know he will carry on for my sake. I spend most of the evening lying on the bed thinking. My body is exhausted but my mind will not let me sleep. I decide to put all my fears and problems into God’s hands and eventually go off to sleep. Dawn arrives and Robin is still in pain. I tell him not to go on, but he insists that I carry on without him. This is not an option for me. So he straps up his shin with rock tape and decides to carry on. Perhaps this is God’s will, I think to myself. Breakfast is spent with an Irishman and his daughter who have just joined the camino. We share stories and gain strength from their optimism.